We give you the sun, the moon, and the stars, and even a bit of outer space. 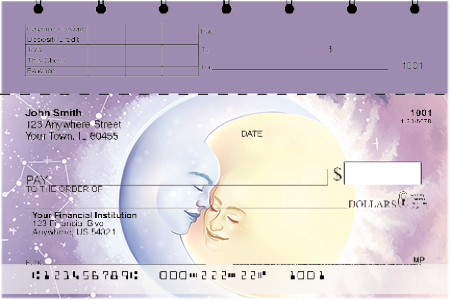 These celestial personal checks also include big puffy clouds and colorful rainbows. Browse the selection of celestial checks and make one yours today! Channel spiritual inspiration with these illustrated celestial designs. Coordinating return address labels available. Pastel colored sky glittered with stars. Four rotating scenes sure to brighten up your night. Bring the night sky to life with four bright and colorful rotating scenes.